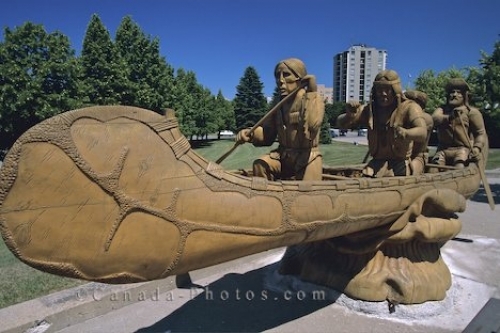 A statue of Native Indians paddling a canoe in a park in Sault Ste. Marie in Ontario, Canada. This magnificent statue is on display in a park in Sault Ste Marie in Ontario, Canada which shows the early days of Native Indians as they paddle their canoe. The history of the Native Indians that resided in earlier years in Sault Ste. Marie is very interesting to learn about. Statue of natives paddling a canoe in Sault Ste. Marie, Ontario, Canada, North America. Picture of a statue of a canoe with Native Indians paddling along in the midst of a park in Sault Ste Marie in Ontario, Canada.